I’d like to thank Heidi at Hands Occupied for the initial inspiration to make these giant artichokes, and The Veggie Box at San Pedro Square Market for letting me take photos at their beautiful store. And lastly, but not leastly, my customers. Nothing is better than doing what you love for a living, and you give that to me. 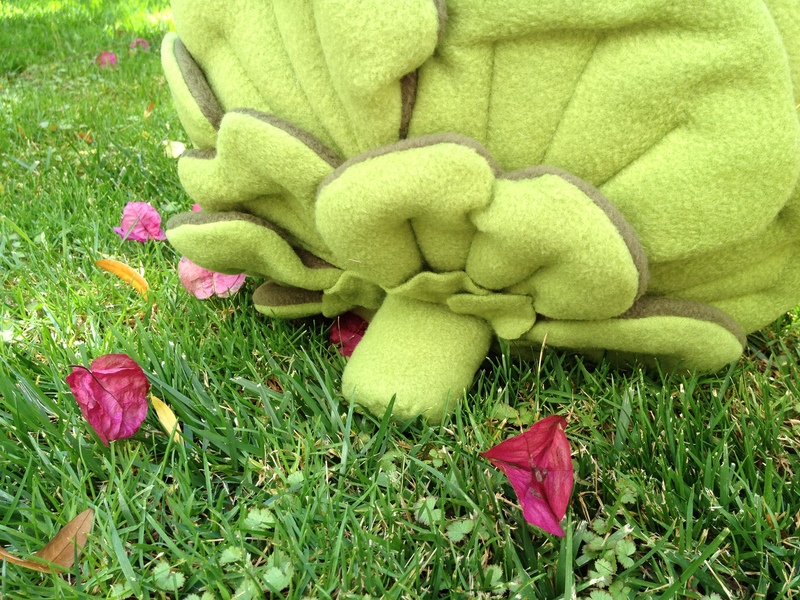 The artichoke has been relisted on Etsy, so go on over and see if you are tempted! First, go get an artichoke. It helps to know what such a thing looks like. Maybe draw a picture, or trace a few leaves. Second, you can eat it now. Steam it with lemon slices and garlic for about 40 minutes and dip the leaves in melted butter. Mmmmm. 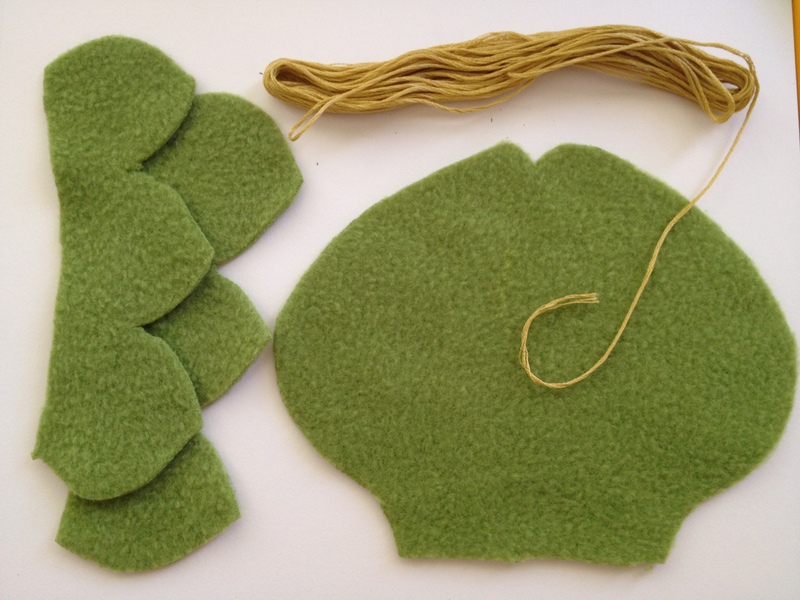 I started with my basic “beach ball” pattern, and made a series of overlapping leaf shapes. 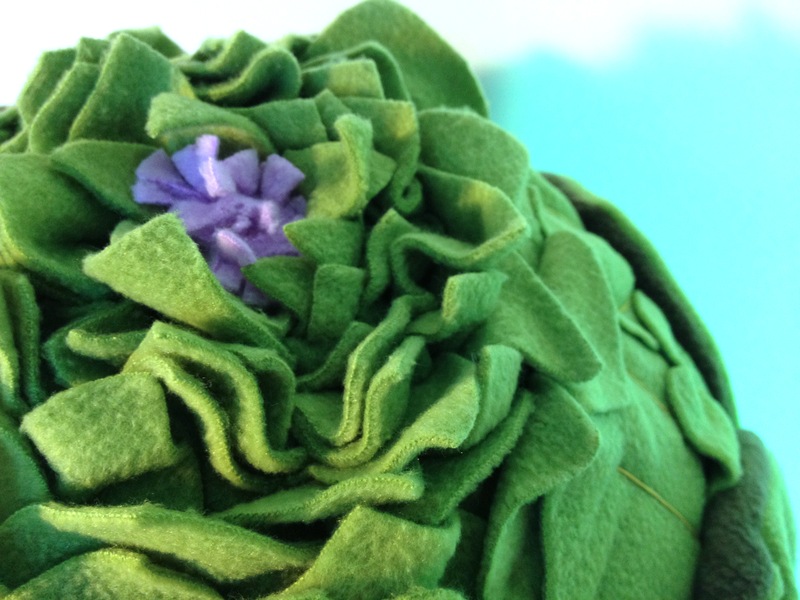 The original artichoke was a little flatter, so I decided to give this one more dimension by making the largest leaves two layers with stuffing in between them. My next innovation was to cut a long row of the smaller leaves and machine-sew them into gathers and coil them around the top. I may do a scarf in this style! 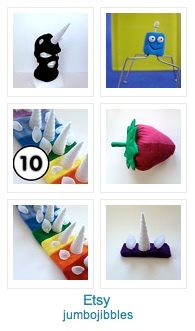 The hardest part of my sculptures is the initial start-up. I am always afraid of two things: I can’t make it better than before and I can’t make it at all. I require a lot of pep-talks along the way. Since I was making lots of changes to this piece, there were many steps where I thought I was about to fail. In the end, I learned new things and came out with a most beautiful finished product. I’ll post more of the photo shoot later this week. 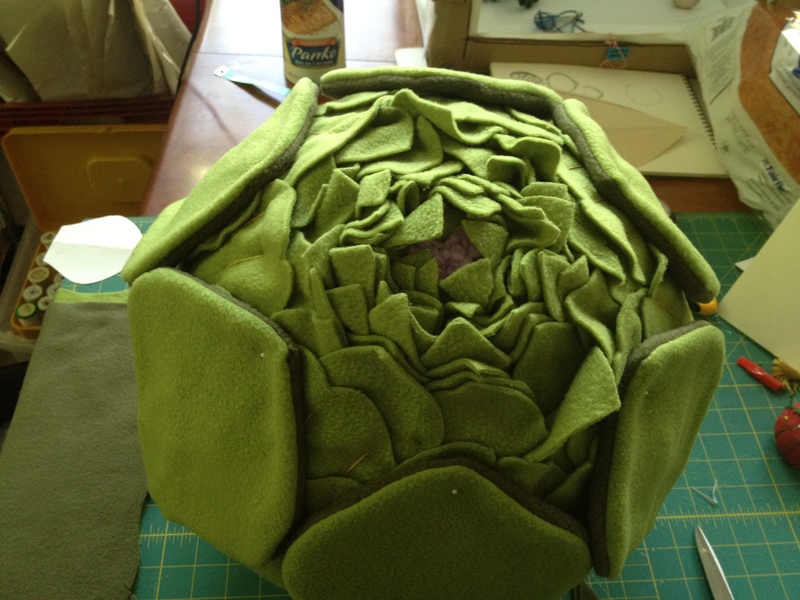 Another artichoke was commissioned a few weeks ago, and now I’m making a new and improved globular fruit. This is the shape that got me started, not so long ago when I was making things as a joke. Giant stuffed fruit? Mwhahahahaha. It’s becoming quite beautiful, and I’ve discovered new techniques which may take me in a fashion direction. On the agenda: leafy scarves and baby blankets. Pardon the canister of Panko in the background. No, this will not be a breaded artichoke. It’s just a perfect size for holding puppets upright! I’m loving my new job at Steve and Kate’s, but it’s hard to get work done when I get home. Kids are so tiring! 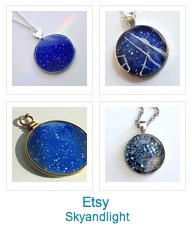 I may not be making a lot of my own, but I’m helping a lot of other crazy stuff get made. Lots. A lot of the campers have started on embroidery, and while they’re still doing basic stitches, they are prolific and think it’s the greatest thing ever. I showed one girl how to do a satin stitch without wasting all your thread on the back end, and she looked at me like I told her the meaning of life. Teaching kids makes you rethink the way you do and say everything, and I think I’ll come out a more articulate person afterwards. 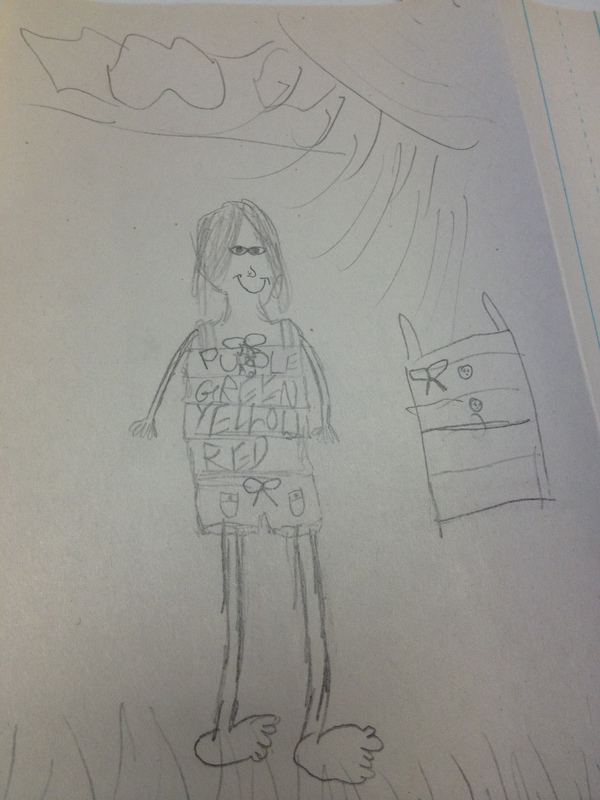 Dress pattern from young camper.